For effective in situ endoscopic diagnosis and treatment, dense and large areal shape reconstruction is important. For this purpose, we develop 3D endoscopic systems based on active stereo, which projects a grid pattern where grid points are coded by line gaps. One problem of the previous works was that success or failure of 3D reconstruction depends on the stability of feature extraction from the images captured by the endoscope camera. Subsurface scattering or specularities on bio-tissues make this problem difficult. Another problem was that shape reconstruction area was relatively small because of limited field of view of the pattern projector compared to that of the camera. In this paper, to solve the first problem, learning-based approach, i.e., U-Nets, for efficient detection of grid lines and codes at the detected grid points under severe conditions, is proposed. To solve the second problem, an online shape-registration and merging algorithm for sequential frames is proposed. 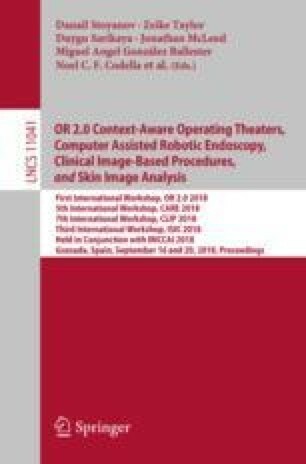 In the experiments, we have shown that we can train U-Nets to extract those features effectively for three specimens of cancers, and also conducted 3D scanning of shapes of a stomach phantom model and a surface inside a human mouth, in which wide-area surfaces are successfully recovered by shape registration and merging. This work was supported by JSPS/KAKENHI 16H02849, 16KK0151, 18H04119, 18K19824, and MSRA CORE14.